The hot trademark story du jour was the news that the two toy companies that own the rights to the SCRABBLE game have sent a letter to Facebook, the popular online social networking website, requesting that it remove a popular online application named Scrabulous that resembles the famed board game. Scrabulous was developed by brothers Jayant and Rajat Agarwalla of Calcutta, India. The application is apparently so popular that it reportedly draws more than half a million Facebook users every day. The intellectual property rights in and to the SCRABBLE game are owned in the U.S.A and Canada by Hasbro Inc. and throughout the rest of the world by J.W. Spear & Sons Limited of Maidenhead, Berkshire, England, a subsidiary of Mattel Inc. In addition, the online rights to SCRABBLE are currently licensed to Electronic Arts (although it appears that Yahoo! currently offers an "authorized" online SCRABBLE game). How the rights to SCRABBLE became split and owned by such arch-rivals as Hasbro and Mattel is an interesting story of its own. The scrabble.com home page requires web users to select which country they reside leading either to http://www.mattelscrabble.com/ or http://www.hasbro.com/. Hasbro’s history of SCRABBLE can be read here while Mattel’s version is here, but what follows is an amalgamation of the two. The game was invented by Alfred Mosher Butts, an out-of-work architect from Poughkeepsie, New York – a cross between anagram puzzles and crossword puzzles that was initially named LEXIKO and later called CRISS CROSS WORDS. Butts supposedly studied the front page of The New York Times in order to calculate letter frequency in order to determine tile letter distribution. After encountering many rejections, Butts found an interested entrepreneur named James Brunot. They made some changes to the game, including naming it SCRABBLE (which actually has a meaning beyond the famed game). In exchange for the right to manufacture the game, Brunot agreed to pay a royalty to Butts. Brunot, through the Production and Marketing Corporation, applied to register the mark SCRABBLE on December 16, 1948; the mark was ultimately registered on April 25, 1950. Brunot, with the help of his wife, initially started manufacturing the game in the living room of his home in Newtown, Connecticut, at a pace of about 18 games per day – hand stamping letters on wooden tiles one at a time. Brunot later moved to an abandoned schoolhouse in Dodgington, Connecticut, where, with the help of friends, production increased to about 12 games per hour. Brunot later outsourced the manufacturing of the board and tiles, but with assembly remaining their main factory. According to SCRABBLE lore, in 1952, Jack Strauss, the Chairman of Macy's at the time, played a game of SCRABBLE while on vacation and enjoyed it so much that when he returned to New York, he contacted the Games Department at his store to send one to him. Supposedly, the Games Department did not have the game in stock, but soon after did. With the help of a Macy’s-backed promotional campaign, SCRABBLE so became the must-have game. Unable to keep up with demand, Brunot licensed the rights to make and distribute the game in the U.S. and Canada to Selchow & Righter Company, a well-known game manufacturer at the time that apparently had earlier rejected the SCRABBLE game. By 1953, the SCRABBLE craze apparently hit both Australia and the United Kingdom. J.W. Spear & Sons launched the game in the U.K. in 1953. (Note: it’s not clear from the online histories how J.W. Spear initially acquired the rights to manufacture the games in the U.K.). Brunot eventually sold off the rights to SCRABBLE. Around 1968, J.W. Spear & Sons acquired the rights outside of the USA, Canada and Australia (although eventually picked up Australia as well). In 1971, Selchow & Righter acquired the U.S. and Canada rights. In 1986, Selchow & Righter was sold to COLECO Industries; but when COLECO declared bankruptcy three years later, the rights to SCRABBLE were purchased by Hasbro Inc., through the Milton Bradley Company. In 1994, J.W. Spear and Sons was acquired by Mattel Inc. – apparently much to the chagrin of arch-rival Hasbro (see this NYT article from 1994). Getting back to Scrabulous, at first glance, Hasbro/Mattel have a pretty strong case. 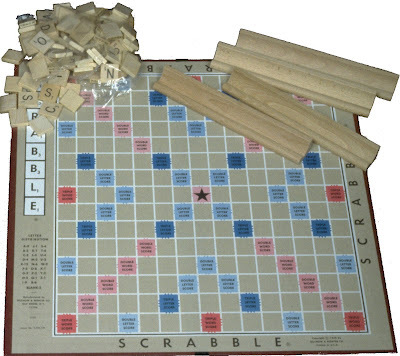 While the marks are not identical in appearance or even sound, the “Scrab-” prefix is similar, the goods are similar (games – Hasbro also holds a SCRABBLE registration for computer game programs), and there is no doubt that the SCRABBLE mark is strong. Under normal circumstances, these factors alone would be enough for Hasbro/Mattel to win the day. However, in this case, the letter was directed to Facebook, where the infringing game is being hosted, and not the Agarwalla brothers, the developers of the game. Facebook may argue that it is the Agarwalla brothers who are directly infringing the SCRABBLE mark, not Facebook. If Hasbro/Mattel try to argue contributory infringement or vicarious infringement, Facebook will maintain that it does not have any direct control or exercise any direct supervision of Facebook users who may be infringing nor does it have any financial interest in such infringing activity. Since Facebook probably has some way that it can prevent Scrabulous from being part of social networking website, I would be surpirsed if Facebook does not simply remove the application and avoid any possible lawsuit. But removing it from Facebook may not remove the application – and if Hasbro/Mattel want to stop the direct infringers from any further use of Scrabulous (through Facebook or online in any other way), then the companies may have to go to India where the Agarwalla brothers reside. But, as far as I can dig up, there is no patent on the game itself (the rules, design or logic of the game). So the only real action here would be to remove the game's NAME not the game itself. The name ('scrabble') is a messy trademark owned by said properties. The game is in the public domain. The only patent ever filed for the game was related specifically to a general patent on the visualization of 'score multiplier' tiles - something to do with keeping them recognizable when covered by game pieces by using small glyphs that extend beyond the edges of the tile (US Patent # 2,752,158 - expired in the early 1970's). So, in addition to the trademark owners having to argue that the name 'scrabulous' infringes directly on the name 'scrabble', they would have to prove that facebook has something to do with said infringement. Considering its popularity facebook should probably just ask the developer to change the name to one of the original (untrademarked) names and ditch any 'scrab' verbiage. Thanks, I appreciate your LEGAL insight into this matter. I was not introduced to Scrabulous via Facebook. I GOOGLED this online site last fall as a means of playing a favorite childhood game with an online audience. I don't care about whether the game continues on FACEBOOK. FACEBOOK is just a vehicle. I care more about the website itself. I hope that Hasbro/Mattel can work out an amicable solution with the Argawalla brothers and Electronic Arts to continue this highly enjoyable website. JW Spear & Sons initially manufactured and distributed Scrabble in the UK on behalf of James Brunot's Production and Marketing Co. They acquired the rights (and gave the game its familiar green packaging) in 1955.